We’d love your help. 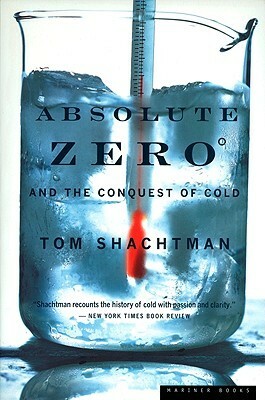 Let us know what’s wrong with this preview of Absolute Zero and the Conquest of Cold by Tom Shachtman. Westminster Abbey and scientists' creation of thermometers. Later, while entrepreneurs sold Walden Pond ice to tropical countries -- packed in "high-tech" sawdust -- researchers pursued absolute zero and interpreted their work as romantically as did adventurers to remote regions. Today, playing with ultracold temperatures is one of the hottest frontiers in physics, with scientists creating useful particles Einstein only dreamed of. Tom Shachtman shares a great scientific adventure story and its characters' rich lives in a book that has won a grant from the prestigious Alfred P. Sloan Foundation. To ask other readers questions about Absolute Zero and the Conquest of Cold, please sign up. I am a chemistry nerd, and this book had all of my favourite characters: The scientists who studied and experimented to get ultra-cold temperatures at the turn of the century. This book frames it is a competition between different labs at different institutions, adding a depth to what could have been a plain, here's-what-happened kind of story. I didn't need a Bachelors in Chemistry to understand what was happening, but the names were more familiar to me because I'd seen them before. A fascinating presentation of the development of the concepts of heat and cold and the measurement of temperature. What this book desperately needed was a few sidebars or an appendix to diagram out the science of cold. Schachtman does a great job building a narrative around a few centuries of scientific endeavors in Europe, but a lot of the tension and drama centers around (of course) the science of cold. I did OK following along in the beginning (and it was a great mental exercise to think through his explanation of expansion and contraction of gasses and so forth) but by the end, when the science is more c What this book desperately needed was a few sidebars or an appendix to diagram out the science of cold. Schachtman does a great job building a narrative around a few centuries of scientific endeavors in Europe, but a lot of the tension and drama centers around (of course) the science of cold. I did OK following along in the beginning (and it was a great mental exercise to think through his explanation of expansion and contraction of gasses and so forth) but by the end, when the science is more complicated, I pretty much gave up. I enjoyed this book a lot, though it was a lot of work to follow the science at times. As several reviewers stated, it is in the general spirit of Dava Sobel's classic Longitude. However, this one is MUCH more detailed as far as science goes. As a result, since I don't have that great a physics background, I had to work at it. It would be best enjoyed by someone who knows physics better than I do, but wants some casual and fascinating history-of-science reading. It's also packed with amazing fodd I enjoyed this book a lot, though it was a lot of work to follow the science at times. As several reviewers stated, it is in the general spirit of Dava Sobel's classic Longitude. However, this one is MUCH more detailed as far as science goes. As a result, since I don't have that great a physics background, I had to work at it. It would be best enjoyed by someone who knows physics better than I do, but wants some casual and fascinating history-of-science reading. A pretty interesting look at the science behind heat, or, more notably the absence thereof. I found it very interesting how long it took for people to truly understand what heat is. Bonus points for naming an alumni of my alma matter and name dropping RPI, although I found it funny that the author referred to it as "Rensselaer Polytech," which nobody in the universe calls the school. At times the book dragged, but the last chapter was really interesting. I work with liquid nitrogen and liquid heli A pretty interesting look at the science behind heat, or, more notably the absence thereof. I found it very interesting how long it took for people to truly understand what heat is. While the writing could have been tightened up a bit (a few parts seemed repetitious), overall it's an interesting history of the science and application of cold. I particularly liked the insight into how refrigeration affected the standard of living in the US and beyond- I had not realized how early in the country's history refrigeration came into use for shipping produce and meat, or what an impact that had. For some reason I thought refrigeration was a twentieth century innovation. This book was a little like reading a meticulously researched, exhaustive, four-hundred page book on tractors. I mean, at the very least you have to respect the effort, and acknowledge that tractor people would really be into it. If I hadn't agreed to read the book so I could teach a honors college class on refrigeration, I'd have stopped after the first 50 pages. I just feel badly for the 160 students in the class, who likewise had to wade through the book. This book makes the history of cold fun. A bit repetitious in tone, but otherwise entertaining discovery of when and how people discovered ways to put cold to use. The bickering between the Victorian scientists adds a gossipy touch that livens things up. The descriptions of harvesting Hudson River ice and of how you achieve temperatures close to absolute zero made this a worthwhile read for me. I thought this was a great short-ish history of cold. The author mostly does a good job progressing chronologically through history, but it's noticeable that he spends half the book in the late 1800s and almost no time in the last hundred years. I would have liked to hear more about the latest science, but overall I enjoyed the book and would read more by him. This book combines two things I love: fascinating science and a riveting personal story. While I'd read about the history of "absolute zero" on Wikipedia, this book fills in a lot of the gaps, providing personal details and a sense of depth that a mere encyclopedia cannot. This topic drew some bizarre personalities so parts of the book were quite lively. A history of artificial cooling. The early chapters are more humanities-based, leading to chemistry and finally to physics and absolute zero.